Do you want to stay in a castle and live luxuriously for a week? If we could, then so can you! In October 2017, my husband and I got married in Italy. We knew before we even got engaged that a destination wedding was something we both wanted to do. We both love traveling and wanted a small wedding. A destination wedding was our way to combine those two things. Click here to read about how we planned a destination wedding! Our plan for our destination wedding was to make it a vacation for everyone! That meant a week-long stay at our wedding venue, le Torri di Bagnara. We decided to pay for the entire estate ourselves to help ease the burden for our guests of paying for a week-long trip over seas. We also helped several of our guests score some great deals on flights (which is our method of purchasing airline tickets). During the week our guests planned their own day trips, meals, etc. Then we would all gather at the villa in the evenings for dinner, drinks, games, and a lot of laughs. We discovered our wedding venue on Luxury Retreats’ website. We took a tour of the estate in December 2016, along with several other properties, when we were deciding on the best location for our week-long wedding vacay. It was the perfect fit for our needs. 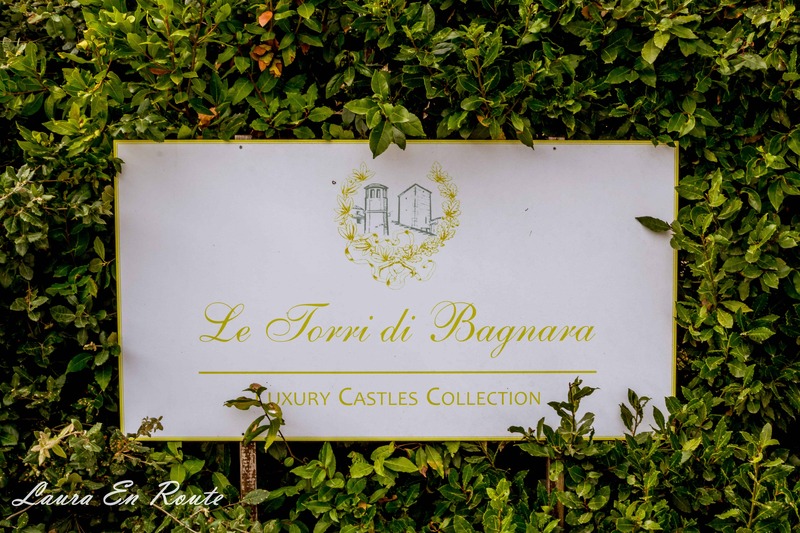 Le Torri di Bagnara has two options for where you and your guests can sleep: the Castle and the Tower. You have to rent the Castle in order to secure a stay at the Tower, but if you’re group is smaller you can rent just the Castle. The Castle consists of 7 bedrooms, a pool hall, kitchen, veranda for dining, a coffee bar, and two sitting rooms. Each bedroom has its own bathroom with tub and shower. The rooms are assigned a flower and decorated according to their flower. Across the courtyard from the main building are two more bedrooms on the second story (or first floor in Europe). The hallway leading to the bedrooms has a window overlooking the chapel which is located next door and available for weddings. On the ground floor is where you’ll find the laundry room, yoga mats, and other equipment you may use during your stay. Next to the building and the small tower are bikes which you may also use around the estate. There is also a rooftop sitting area at the Castle with views over the courtyard and bocce court, perfect for enjoying your own happy hour or nap. The Tower is located further up the road and has 7 more bedrooms. (There is parking available at the Tower). The rooms are divided into suites: two bedrooms connected by a small sitting room and kitchenette and shares a bathroom. One bedroom is located on the outside of the Tower and has its own kitchen, sitting area and bathroom. Next to the tower is a playground! With the variety of rooms, sitting rooms, and space available at le Torri di Bagnara, this luxury retreat is the perfect location for a large group of family or friends! There are 3 options for breakfast when staying at le Torri di Bagnara: make your own, chef prepared, or continental. With 22 people and a 2 year old, the easiest option for us was to have a continental breakfast in the morning. Between the kitchen and the veranda, there was a small room where the breakfast was set out every day. Our guests would help themselves and eat together in the veranda. Normally, the breakfast is offered Monday – Saturday (you rent the estate from Saturday-Saturday). We added Sunday service for an extra fee to make things easier for our guests. This way we didn’t have to figure out where to go for food or pre-order groceries to make our own breakfast while feeling jet lagged. We were also able to alter the time the breakfast would be available: 8 AM until 10 AM. Usually, breakfast begins at 9 AM but we had some early risers in our group. Also, by starting earlier some of our guests traveling far for day trips could still eat breakfast or grab something before they left. There is a set menu for the continental breakfast. It is a lot of food! I wish i was hungrier when I wake up so I could have indulged more because everything looked so good and I just wasn’t hungry enough. Though there was a set menu, there was still a variety of options from day to day. One day there would be waffles and another day you’d wake up to find eggs and bacon. You and your guests will not go hungry while staying at the castle! During breakfast, there is staff on site to help replenish the food, remove dirty dishes, and prepare coffee. My first stop every morning was at the coffee station. I’d ask for an americano and try to wake up as much as possible before eating. You can also order a cappuccino! (The machine uses pods so its not the real thing, but its close enough when you’re craving coffee). You can use the machine during the day, too, if the staff isn’t present. Just note that you are charged per coffee pod you and your guest use during the week. We visited in mid-October so the weather and water were too chilly for swimming. The owner of the estate has plans for turning the pool in a heated one, so even if you visit during the cooler months you could still enjoy this feature. Some of our braver guests jumped in when we first arrived and went for polar bear swims in the mornings! I did not partake. Even if you do not swim, its a beautiful spot to lounge around and enjoy the sunlight and view. It also made for a great location for our cocktail hour during our wedding (check out my post on planning a destination wedding here). The estate is located on 1,500 acres, providing plenty of opportunities for exploring without ever leaving grounds. I only spent one day hiking one of the trails on the estate, but could have easily spent several days hiking. The grounds are covered with wildflowers, trees hundreds of years old, and old buildings in need of repair (or in the processes of renovating). There are 5 small lakes and several streams (none of which we saw on our hike). You may be lucky and spot deer or hare, or less lucky and see some wild boar when roaming the estate. (One of our guests caught some boar on video running in the opposite direction). Down the road from the Tower is an olive orchard. You can walk freely among the rows of trees and pick some olives (though I don’t recommend eating them). I took some of my wedding photos in the orchard, which you can see here or on my instagram. This was the trail my friend and I took on our first day at le Torri di Bagnara. We tried to follow the map, but somehow missed where the trail looped back. We ended up hopping a fence to the main road and walking to the entrance of the estate. Another option for seeing the estate is to borrow one of the bikes. There are some decent hills, so chose whichever method fits your level of athleticism. Be sure to find all of the Kiss Spots on the estate! There is one at the Tower and several along the hiking paths. My friend and I found 3! When we travel we try to stay in apartments using services like airbnb so we can feel more like a local. The best way to feel like a local is to shop for and cook a meal you prepare yourself. Staying at a castle was no different. With a large, fully stocked kitchen several of our guests prepared their own dinners on several evenings. We would either purchase food while in a town we were visiting, or from the grocery store nearby. (Shopping in another country is an experience everyone should have!) You can also pick herbs and vegetables from the garden located behind the courtyard. Our guests never prepared anything too fancy, usually just pasta, but it was still better than when we’d make these dishes in the States. It was also nice to spend time with our friends and family and talk about what everyone did during the day. If you don’t like cooking, don’t worry! You can hire the chef to prepare meals for you during the week! We had a pizza dinner on the night we arrived. There was a lot of food and several varieties of pizza. We also had a chef prepared three-course meal the night before our wedding. During our stay, the conceirge, Marcella, was always nearby to answer any questions or help our guests with anything we may have needed. We communicated with her through the app WhatsApp so we could reach her 24/7. She helped us with our wedding vendors when they arrived, last minute details for our chef prepared meals, figuring out the washing machines, and providing tips for attending the Chocolate Festival in Perugia. Marcella would be present during breakfast in the morning and in the evening to make sure things were going smoothly. It was extremely helpful to have someone onsite and present who was also very friendly. All of our guests felt comfortable approaching her for anything. Located halfway between Rome and Florence, le Lorri di Bagnara, is in a great location for day trips. It’s about a 2 hour drive to Rome and a little less to Florence. For many of our guests, it was their first time in Italy and a great opportunity for them to see as much of the country as they could during their stay. Some of our guests went to both Rome and Florence. They were long days, but enjoyable. Although one day is not nearly long enough to spend in either city, it was enough time for our guests to see the major sites: the Colosseum, Roman Forum, Pantheon, Spanish Steps, Trevi Fountain, and the Vatican; the Duomo, Ponte Vecchio, and Uffizi Gallery. My husband and I had already been to both cities for Christmas so we skipped the major cities during our week at the villa. Click here to read about our trip to Rome and here for a post on Florence. There are several smaller towns nearby that make for great day trips. Gubbio is the closest and is an old medieval town with plenty to see and do in one day. Click here to read about our visit to Gubbio. One of of the most popular cities nearby is Assisi, famous for its connection to the Patron Saint, Saint Francis. Click here to read about our trip to Assisi. A larger city in the vicinity is Perugia. Although it appears to be more of an industrial city, there are plenty of streets and buildings with traditional Italian charm. This is also where the annual Chocolate Festival, Eurochocolate, is held. Click here to read about our experience at the Perugia Chocolate Festival. The closest grocery store is Conad. It is located about 15 minutes down the highway. You’ll likely want to make a trip or two to the grocery store for wine, snacks, or ingredients for home cooked meals. Our guests made a few stops at Conad during our stay. The wifi signal is not as strong as you’re likely used to having at home or in hotels, especially if there are 20 people trying to use it at once. Also, the signal also does not stretch beyond certain rooms in the castle and tower. If you have something that provides wifi where ever you go, I suggest bringing it. Otherwise, take this as an opportunity to unplug for a week (or at least to unplug for most of the day). If you’re renting a car to reach the estate (which I recommend so you and your guests have more freedom to come and go as you please) you’ll want to rent a GPS with your car. The GPS devices that come with the cars will let you know the speed limit and when there are speeding cameras. It’s also easier to enter the address or coordinates into a GPS than to use google maps or printed out maps. We entered the name of the estate into our GPS and the correct directions came up. The coordinates we received from the concierge did not seem correct, however, so it is best to verify before you arrive in Italy. Shoes for walking around the Castle grounds. If your guests are staying in the Tower, they’ll want shoes for walking down the hill in the morning for breakfast or late at night. If you’re staying in the Castle, you’ll want shoes for lounging around or for walking to the pool. Of course, if you plan on hiking or riding bikes, you’ll want to bring appropriate shoes for those activities. Extra Cash – Depending on what services you request during your stay, you may have to pay some fees upon check out. Bring cash to make payment easier. Each room has its own safe where you can store it for safe keeping. Camera, Selfie Stick, etc. – No vacation packing list is complete, in my opinion, without a camera. You’ll definitely want one for your stay at le Torri di Bagnara, even if you never leave the estate. There is plenty to see and opportunities for group photos (or selfies) while staying there! No hair dryer. Each rooms is equipped with a hair dryer so save room in your luggage and leave yours at home. Swimsuit, no towel necessary. Whether you’re staying during the summer or wish to go for a polar bear swim, you won’t want to forget your bathing suit and miss out on swimming in the saltwater infinity pool or lounging poolside. You’ll find an extra towel in your room to use as a pool towel. Jacket. In October, the weather during the day was beautiful, warm and sunny, but as soon as the sun went down it was very cold. If you plan on playing late night bocce ball games, be sure to pack some warm layers! Bluetooth Speaker. Two of our guests each brought their travel sized speakers and we’re so glad they did! It was great to have music as we cooked meals, played bocce ball, or just relaxed by the pool. If you love music, I suggest bringing a speaker of you own! What amazing places have you stayed when traveling? What a lovely way to celebrate your union! Making memories with friends and family to last a lifetime! Thanks! It was wonderful and I highly recommend it, even without a wedding!